American opposition to the British authorities kept steadily rising as assemblies were dissolved, the houses of citizens searched, and troops distributed in increasing numbers among the centers of discontent. Merchants again agreed not to import British goods, the Sons of Liberty renewed their agitation, and women set about the patronage of home products still more loyally. On the night of March 5, 1770, a crowd on the streets of Boston began to jostle and tease some British regulars stationed in the town. Things went from bad to worse until some " boys and young fellows " began to throw snowballs and stones. Then the exasperated soldiers fired into the crowd, killing five- and wounding half a dozen more. The day after the " massacre," a mass meeting was held in the town and Samuel Adams was sent to demand the withdrawal of the soldiers. The governor hesitated and tried to compromise. Finding Adams relentless, the governor yielded and ordered the regulars away. 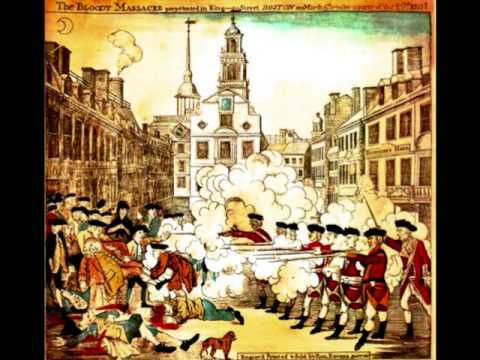 The Boston Massacre was the killing of five colonists by British soldiers on March 5, 1770. It was the culmination of civilian-military tensions that had been growing since royal troops first appeared in Massachusetts in October 1768 to enforce the heavy tax burden imposed by the Townshend Acts. 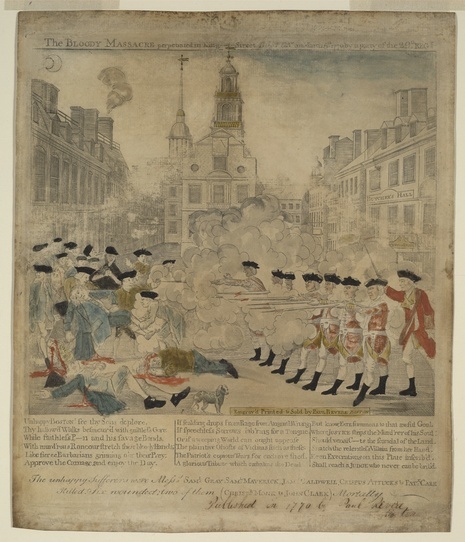 The incident started on King Street, today known as State Street, in the early evening of March 5, in front of Private Hugh White, a British sentry, as he stood duty outside the Custom house. A young wigmaker's apprentice named Edward Gerrish called out to a British officer, Captain Lieutenant John Goldfinch, that Goldfinch had not paid the bill of Gerrish's master. Goldfinch had in fact settled his account and ignored the insult. Gerrish departed, but returned a couple of hours later with companions. He continued his complaints, and the civilians began throwing snowballs at Goldfinch. Gerrish also exchanged insults with Private White, who left his post, challenged the boy, and then struck him on the side of the head with a musket. As Gerrish cried in pain, one of his companions, Bartholomew Broaders, began to argue with White. This attracted a larger crowd. As the evening progressed the crowd grew larger and more boisterous with a momentary lull. The mob grew in size and continued harassing Private White. As bells rang in the surrounding steeples, the crowd of Bostonians grew larger and more threatening. Private White left his sentry box and retreated to the Custom House stairs with his back to a locked door. Nearby, from the Main Guard, the Officer of the Day, Captain Thomas Preston, watched this situation escalate and, according to his account, dispatched a non-commissioned officer and several soldiers of the 29th Regiment of Foot, with fixed bayonets, to relieve White. He and his subordinate, James Basset, followed soon afterward. Among these soldiers were Corporal William Wemms (apparently the non-commissioned officer mentioned in Preston's report), Hugh Montgomery, John Carroll, James Hartigan, William McCauley, William Warren and Matthew Kilroy. As this relief column moved forward to the now empty sentry box, the crowd pressed around them. When they reached this point they loaded their muskets and joined with Private White at the custom house stairs. As the crowd, estimated at 300 to 400, pressed about them, they formed a semicircular perimeter. The crowd continued to harass the soldiers and began to throw snow balls and other small objects at the soldiers. Private Hugh Montgomery was struck down onto the ground by a club. When he recovered to his feet, he fired his musket, later admitting to one of his defense attorneys that he had yelled "Damn you, fire!". It is presumed that Captain Preston would not have told the soldiers to fire, as he was standing in front of the guns, between his men and the crowd of protesters. However, the protesters in the crowd were taunting the soldiers by yelling "Fire". There was a pause of indefinite length; the soldiers then fired into the crowd. Their uneven bursts hit eleven men. Three Americans — ropemaker Samuel Gray, mariner James Caldwell, and a mixed race American sailor named Crispus Attucks — died instantly. 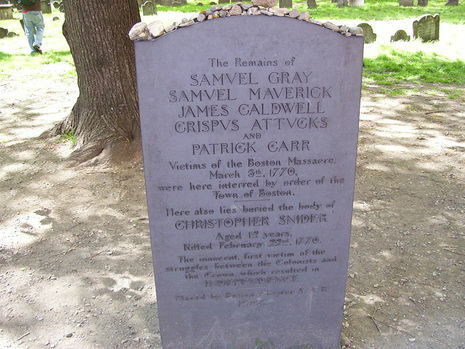 Seventeen-year-old Samuel Maverick, struck by a ricocheting musket ball at the back of the crowd, died a few hours later, in the early morning of the next day. Thirty-year-old Irish immigrant Patrick Carr died two weeks later. To keep the peace, the next day royal authorities agreed to remove all troops from the centre of town to a fort on Castle Island in Boston Harbor. On March 27 the soldiers, Captain Preston and four men who were in the Customs House and alleged to have fired shots, were indicted for murder. A young Bostonian artist, Henry Pelham, half-brother of the celebrated portrait painter John Singleton Copley, depicted the event. Boston silversmith and engraver Paul Revere closely copied Pelham's image, and thus often gets credit for it. Pelham and Revere added several inflammatory details, such as Captain Preston ordering his men to fire and another musket shooting out of the window of the customs office, labeled "Butcher's Hall." Another discrepancy arose because of how artist Christian Remick hand-colored some prints: the bright blue sky does not accord with the quarter moon or dark shadows on the left side of the image. Some copies of the print show a man with two chest wounds and a somewhat darker face, matching descriptions of Attucks; others show no victim as a person of color. The inflammatory, bright red, "lobster backs" and glowing red blood now hung in farmhouses across New England. Revere had accomplished his goal of widely circulating an effective piece of anti-British propaganda. "The General Court, at the first session after the arrival of the troops, viewed it in this light, and applied to Governor Bernard to cause such a nuisance to be removed; but to no purpose. [Text missing]....then challenging the inhabitants by sentinels posted in all parts of the town before the lodgings of officers, which (for about six months, while it lasted), occasioned many quarrels and uneasiness. "Capt. Wilson, of the 59th, exciting the negroes of the town to take away their masters' lives and property, and repair to the army for protection, which was fully proved against him. The attack of a party of soldiers on some of the magistrates of the town-the repeated rescues of soldiers from peace officers-the firing of a loaded musket in a public street, to the endangering a great number of peaceable inhabitants-the frequent wounding of persons by their bayonets and cutlasses, and the numerous instances of bad behavior in the soldiery, made us early sensible that the troops were not sent here for any benefit to the town or province, and that we had no good to expect from such conservators of the peace. "The actors in this dreadful tragedy were a party of soldiers commanded by Capt. Preston of the 29th regiment. This party, including the Captain, consisted of eight, who are all committed to jail. "Benjamin Frizell, on the evening of the 5th of March, having taken his station near the west corner of the Custom-house in King street, before and at the time of the soldiers firing their guns, declares (among other things) that the first discharge was only of one gun, the next of two guns, upon which he the deponent thinks he saw a man stumble; the third discharge was of three guns, upon which he thinks he saw two men fall; and immediately after were discharged five guns, two of which were by soldiers on his right hand; the other three, as appeared to the deponent, were discharged from the balcony, or the chamber window of the Custom-house, the flashes appearing on the right hand, and higher than the left hand flashes appeared to be, and of which the deponent was very sensible, although his eyes were much turned to the soldiers, who were all on his right hand..."